Above: Universal Utility clothing designer and slow fashion advocate, Carin Mansfield in one of her own designs. In the three years since I have met Carin Mansfield, the slow fashion designer behind the cult label Universal Utility — Egg and Comme des Garçons fans will most likely know the label already — I have acquired 6 items of clothing from her Fitzrovia shop in London, In-ku. It would be no exaggeration to say that I can wear at least one of these 6 items on a daily basis. Beautifully cut out of exquisite fabrics and hand finished, Carin’s designs combine style and comfort, never failing to make me feel my best. The are clothes that I wear as opposed to clothes that wear me. If eco-clothing activist Livia Firth advises only buying something you know you’ll wear at least thirty times, my Universal Utility clothes typically hit that benchmark in two months. Join us as we talk to Carin about her extraordinary journey from being a care nurse in South Africa to a cult label designer and slow fashion advocate in London. 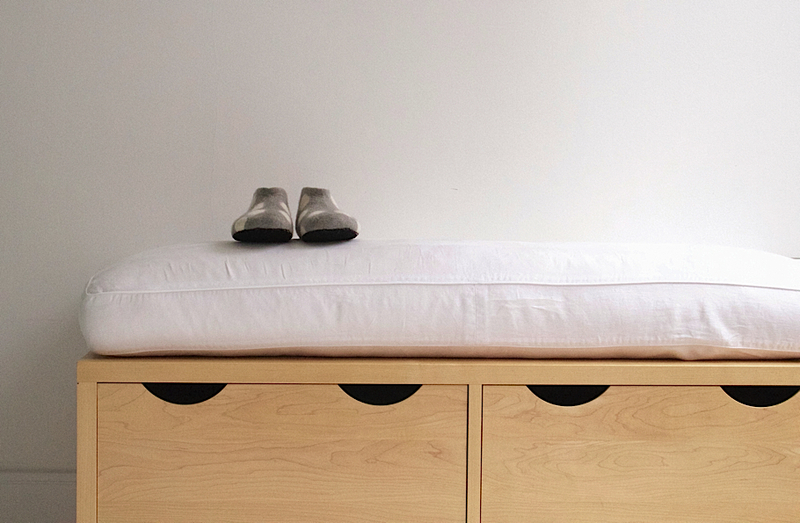 Above: Based in Fitzrovia, In-ku is small and serene. FF – As a self-taught designer, can you please tell us how you started working in fashion? CM – It was a complete accident and not what I set out to do. My first career was in nursing and after working as a critical care nurse for 10 years, I needed a change. 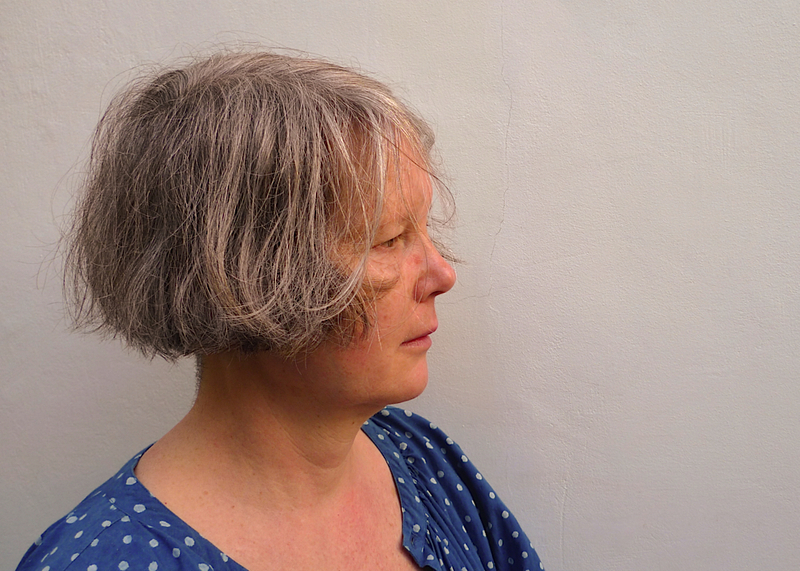 I had moved to London from Johannesburg with my then husband, who was a journalist. We were living next door to an agent who represented photographers and stylists and she introduced me to the world of fashion. And before I knew it, I was working as a stylist, producing shows during London Fashion Week with people like Amanda Harlech and John Galliano. In Peter Greenaway’s 1989 critically acclaimed film The Cook, the Thief, His Wife & Her Lover, with costumes by Jean Paul Gaultier, I worked in the wardrobe section with costume designer Annie Symons and continued working with her for four years on other films and pop videos. Above L: A wool gingham ensemble. 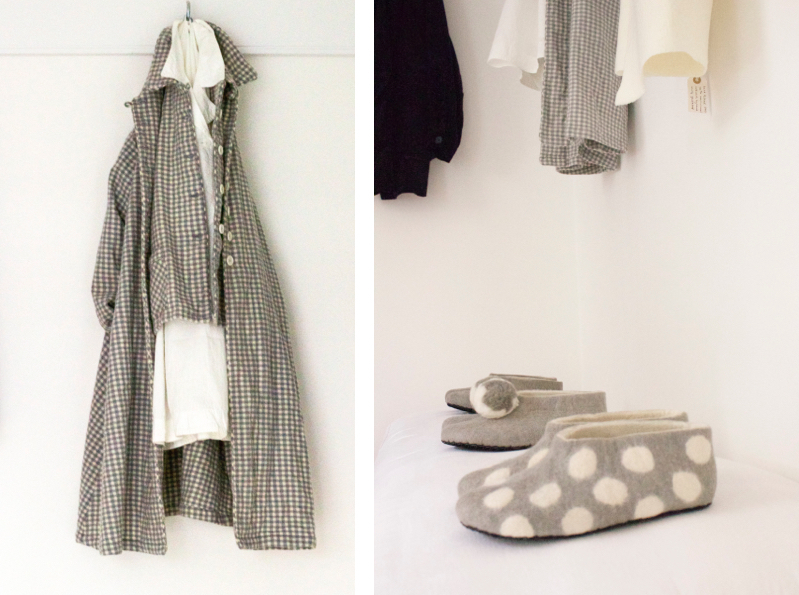 Above R: Merino felt wool unisex slippers complement the clothes. FF – How did you go from stylist to designer? CM – When you work on exciting projects that are breaking new ground, you are seldom payed in cash but are instead given designer clothing or costumes. To make ends meet, I was still doing night shifts as a critical care nurse and every Friday, I set up a stall in the vintage market on Portobello Road. All sorts of costume designers stylists would show up with the goods they had earned to sell to various fashion editors. That was the scene. After I ran out of clothes, I began to sew my own designs to sell. 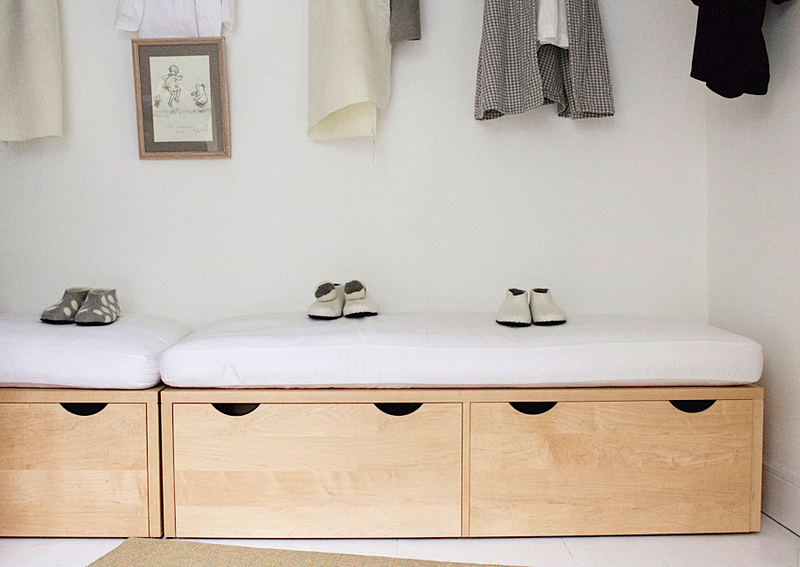 Above: Carin maximises space by combining storage with seating. FF – How did selling clothes at Portobello Market develop into the cult label that Universal Utility is today? 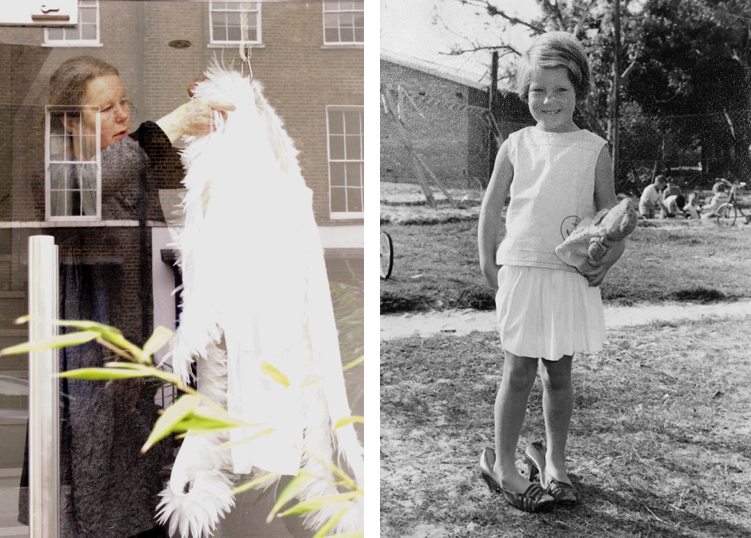 In 1996, a friend of mine suggested that I introduce my designs to Maureen Doherty, the founder of Egg. At the time, Maureen was doing something very new in retail. Her curation was a complete work of art and it was attracting a great deal of attention from everyone, including the Japanese. Selling my clothes at Egg was really the beginning for me. This is where Rei Kawakubo from Comme des Garçons found me. She later invited me to show the Universal Utility label at Dover Street Market, which I did from 2004 – 2009. Another Japanese company called The Baycrews Group also found me at Egg and I supplied my designs to them for seven years. I had three machinists and was supplying 10 shops and was working around the clock. Eventually, it all got to be too much and in 2013, I decided to open my own shop In-ku in order to consolidate and focus. 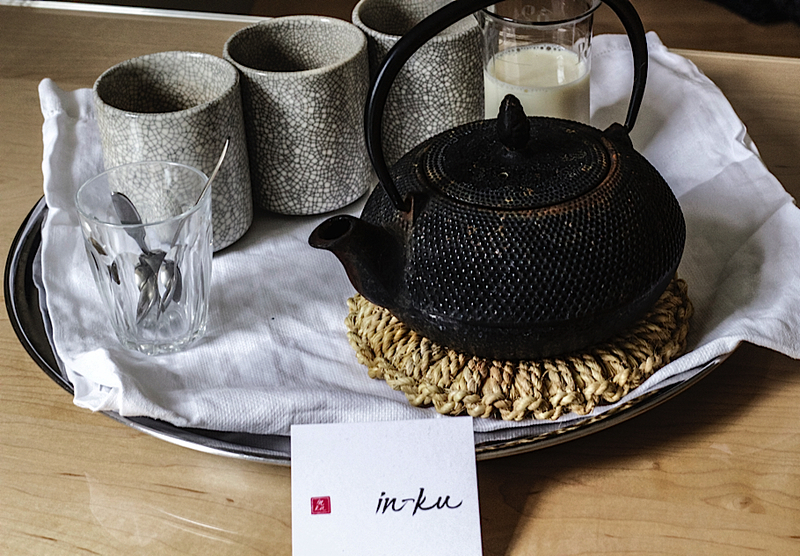 Above: A visit to In-ku often involves a cup of tea. FF – Tell us about your customers? CM – A great variety of people walk through our door — men and women from all over the world. Some, to whom we are very grateful, have been buying our clothes for years; and, of course, we’re always excited when new people find us. Many of our customers are in creative fields. For instance, we attract a great number of fashion students from Central St. Martins. Our shop is tiny but perfectly formed. And when people come to see us, it’s about more than shopping. They come for a chat, tea and inspiration. And often, they’ll walk out with something they love. Above L: On the Universal Utility Instagram account, Carin posts images that inspire her. This image is from the Salt Satyagraha, a nonviolent protest initiated by Mohandas Gandhi in colonial India on 12 March 1903. Above R: A detail from a Universal Utility white cotton work dress. 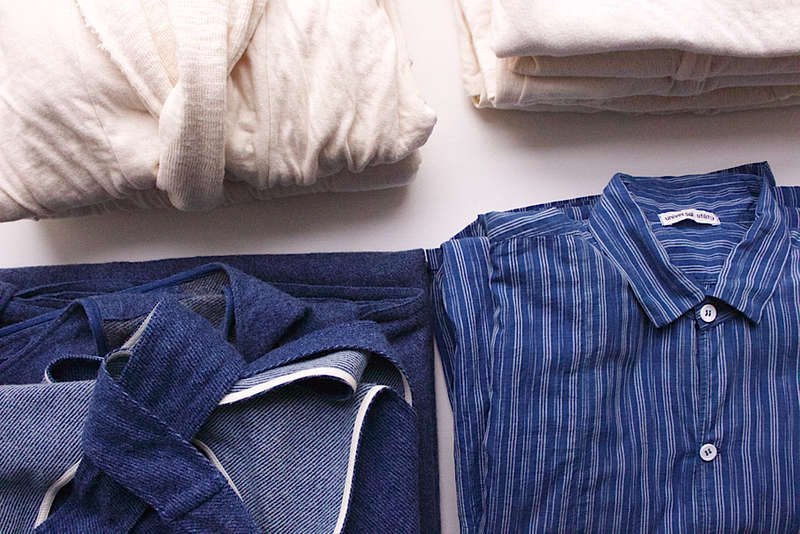 Above L: A detail from a Universal Utility Indigo Cotton and Wool Poilu Coat. Above R: French “Poilu” and their care nurses during World War 1. Above: An apron dress from the Poilu Collection is displayed next to a striped blue and white khaki shirt. FF – How do you design a collection? CM – I am inspired by all sorts of things. Often there is a narrative — always with a nod to the past — and sometimes you just see the fabric and think, “what can I make from this cloth?” The scale of my production means that my fabric run orders are often smaller than the minimum requirement of many mills. This means I have to be more inventive with the fabric and I often work with remnants from larger runs. Alternatively, working on a small scale can be used to my advantage as well because it means I have the freedom to work with more interesting or rare fabrics that the bigger designers can’t go near. For example, I recently came upon an interesting weaver who weaves wool indigo by the metre on vintage looms. When I went to see him, I was charmed by him and his situation and decided I had to work with his fabric. And then I went looking for the story of the collection, a concept I could work to. I came across a book with evocative photographs of the French “Poilu” from World War 1 which spoke to me — utility, work wear, the soldiers being cared for by nurses. From these photos came the story of my Winter 2015/2016 collection. 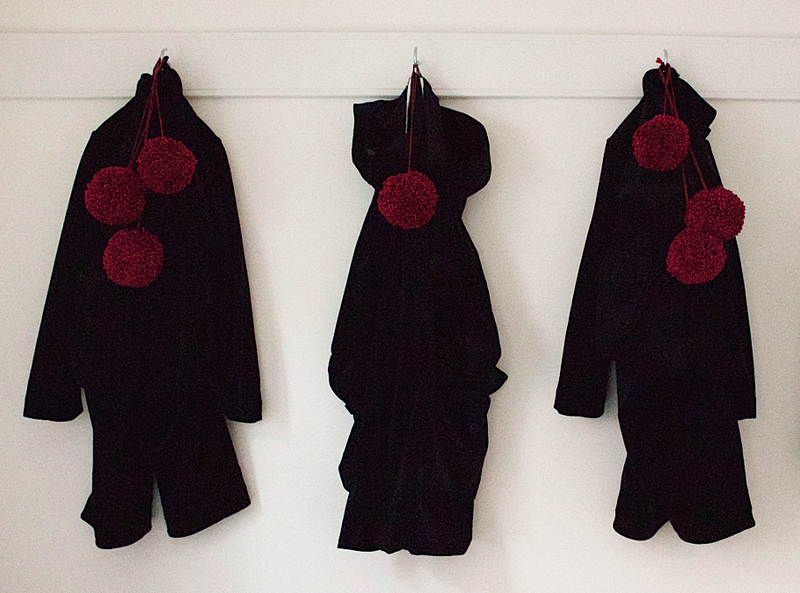 Above: Red wool pom poms accessorize black wool coats. 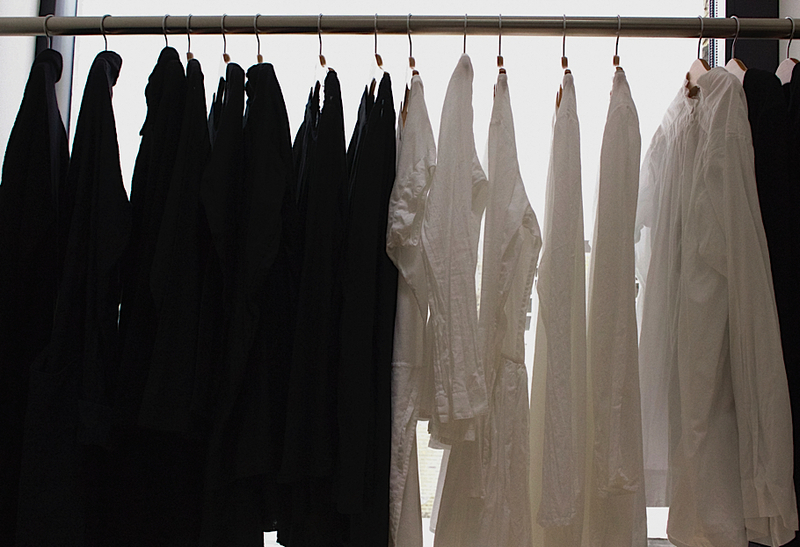 Above: Black and white Universal Utility designs are staples at In-ku. Above L: Carin works on a display in the window of In-ku. Above R: The young designer tries on a pair of shoes. FF – Has the hard work of being shopkeeper been worth it? CM – On balance, I would say, “yes”. You have to be exceptionally mad though and I work all the time with next to no distractions. For me, it’s always been about the satisfaction of making a quality product. Money making comes second. I have come to accept and enjoy that you can’t do slow fashion in a big way. 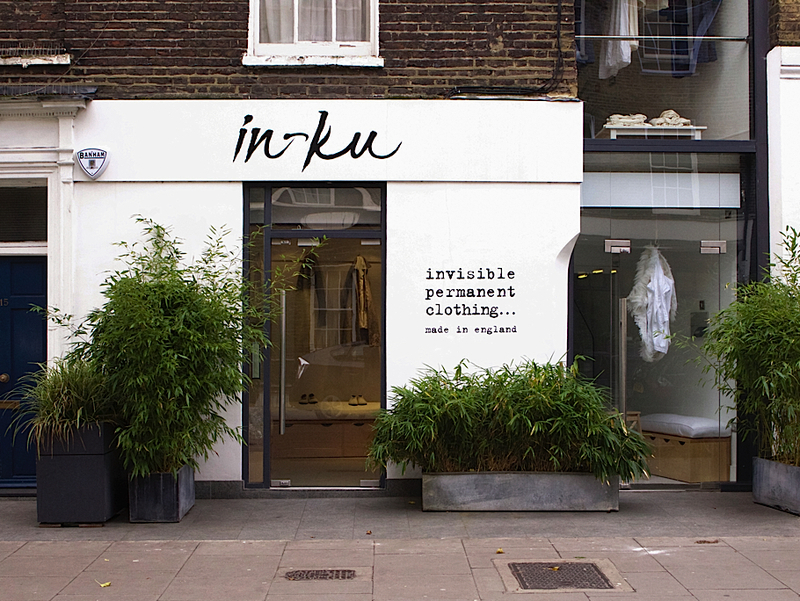 Above: In-Ku is on 15a Warren Street in Fitzrovia, London. FF – “invisible permanent clothing….” What do you mean by this? CM – This has several meanings. In-ku is a play on words. In Japanese, it is a broad term used for dye or ink. Since I work often in a black and blue medium, the ink becomes invisible, so to speak. Philosophically speaking, “all phenomena are impermanent” and on a practical level, I wanted to make understated clothes that last. Above: The many threads of Carin. Artwork by Christine Chang Hanway. A Fabulous Fabster thank you to Carin Mansfield! Really I do , but I just need some long pants, an undershirt , shirt, jacket and a dress that might be an under dress and an over dress. I wear a size 4X as in very large. Let me know how much so I can start saving for it. Fabulous clothes and I now appreciate her ethos in clothing I look to buy-will be on my must see list when next in town. Thanks so much for the introduction! Thanks, Caroline. A visit to In-ku is a definite must the next time you are town. You won’t be disappointed. Best, Christine. I live in Massachusetts and value your creative and work ethic. How can i purchase your designs short of traveling to England? Hi Andrea. Thanks for writing in. Carin would be more than happy to help you with this. You can contact her at info@uuin-ku.com. All the best, Christine. I’m in love, i would like to have it all, thanks for this introducion ! Pleasure, Diana. Yes Carin’s clothes are a joy on every level. All the best. Christine. Went to In-Ku July 2018. I was spellbound by the beauty of the clothes. The shop itself was a delight of light, understatement and simple details. Be still my lusting heart. In-Ku is the most incredible place and I am so glad you made it there in July to experience its magic! I am kicking myself. I was just in London for nearly 2 weeks and I did not know about your store until tonight, Christmas Eve in New York! I have been looking for a winter coat for 2 YEARS! Can you show me some things? Merry Christmas! What a shame you didn’t get a chance to visit Universal Utility when you were in London before Christmas. It’s a real treat. The best way to see what Carin Mansfield is doing with Universal Utility is through their Instagram account — https://www.instagram.com/universalutility/. Or contact them directly through their website.